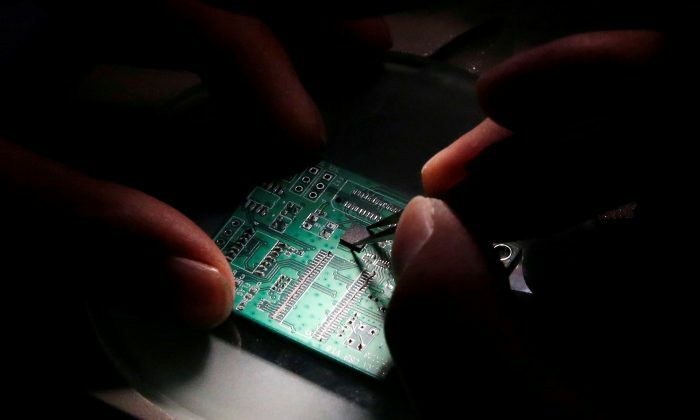 HONG KONG—China’s top state chip manufacturer Tsinghua Unigroup has signed a deal to acquire French smart chip components maker Linxens for about 2.2 billion euros ($2.6 billion), five people with direct knowledge of the matter said. The deal, which the sources said was signed over a month ago but has not yet been announced publicly, will be a key test of European regulators’ stance on Chinese investment in the region, which has grown in recent months amid China’s worsening trade relations with the United States. Tsinghua’s acquisition of Linxens from Luxembourg-based private-equity group CVC is still pending regulatory clearance, three of the sources told Reuters, adding that regulators in France, Germany, and the company’s union need to approve the deal. The authorities are not expected to object, the sources said, on condition of anonymity as the information is confidential. Tsinghua and Linxens did not respond to requests for comment. According to three sources, Tsinghua has already locked in a deal with four banks for a 1.5 billion euros ($1.75 billion) bridge loan to fund the transaction. Credit Suisse, a main lender in the loan, also advised the seller, the people said. Before the Linxens deal, Tsinghua Unigroup accumulated a stake in Germany’s Dialog Semiconductor, buying into share price weakness as the Anglo-German chipmaker faced uncertainty over its business relationship with Apple, its largest customer, towards the end of last year. The stake, held via two wholly owned subsidiaries, reached 9 percent in December, according to company filings, making the Chinese investor the single largest shareholder in Dialog. Tsinghua did not respond to requests for comment at the time. Failure to get local regulatory approval has previously scuttled Tsinghua’s offshore investment plans, such as share purchases totaling $2.6 billion from three Taiwanese chipmakers—Powertech Technology, ChipMOS Technologies, and Siliconware Precision Industries—that fell through in 2016 and 2017. That followed a 2015 debacle when an informal $23 billion approach for U.S. chipmaker giant Micron was rejected by the Idaho-based company amid national security concerns. Recently, the United States has strengthened scrutiny of Chinese investments amid concerns that they could lead to theft of critical U.S. technology. The U.S. Congress is set to pass a bill that would strengthen an inter-government agency’s ability to scrutinize foreign purchases of American assets. So far this year, China has spent $45.5 billion on European assets, more than double year-ago levels, while its investments in the United States has dropped 75 percent to $1.9 billion, according to Thomson Reuters data. Linxens, which does not have a U.S. presence according to its website, makes connectors crucial for communication between smart cards and electronic readers. By Kane Wu and Prakash Chakravarti.